Author: Norbert Cyffer. Series edited by: Herrmann Jungraithmayr, Norbert Cyffer. 14 pp. Roman, 226 pp. With about four million native speakers Kanuri is spoken in the Lake Chad region, mainly in northeastern Nigeria, eastern Niger and the province of Kanem in the Chad. Furthermore, it is spoken in the oases of Bilma and Faschi (Niger) and also sporadically in Fezzan (Libya). Kanuri was the official language of the outstanding kingdom of Kanem-Borno. Today, it is an officially acknowledged language used regionally in Nigerian schools. It is also applied as a medium in broadcasting and television. The present dictionary includes 9,000 entries based on the dialect of Maiduguri, which is acknowledged as the standard form in Nigeria, and is structured to serve for practical as well as academic usage. 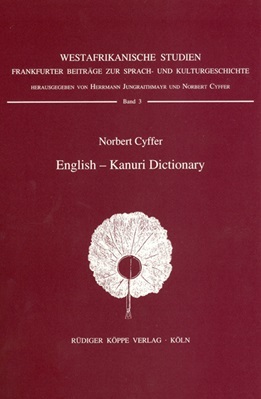 Tones are marked additionally to the Standard Kanuri Orthography applied in this dictionary. The complex verb entries include references to verbal classes and to extensions (passive, causative, etc.). All the lexical entries are illustrated by text examples and idioms. Das vorliegende English-Kanuri Wörterbuch [...] zeigt auf beeindruckende Weise, wie gut das im Tschadsee-Raum von etwa vier Millionen Sprechern gesprochene Kanuri inzwischen dokumentiert ist. [...] Eines der hervorzuhebenden Merkmale dieses Wörterbuchs ist die sehr systematische Eingabe der lexikalischen Daten. This dictionary is an improved reverse of Dictionary of the Kanuri Language, published by the same author in 1990 and reviewed in this journal (A.I.U.O. 1990, L no.4, 451–452). It covers a gap in this field, where up to now there was no English-Kanuri dictionary, except a small mimeographed work by Dr. F.G. Priestman, which consists mainly of words taken out from the Kanuri-English vocabulary in Lukas’ grammar. It is with pleasure that some suggestions and remarks, done in my review, were accepted. In fact he says: ‘Loan words are marked according to their assumed immediate origin in their basic form only. Therefore compounds or extensions are usually not marked’ (Introduction, p. x). The loans are marked from the following languages: Arabic, English, French, and Hausa.